This is a relatively common variety, yet it is only occasionally seen with the rim break over T of UNITED as it is here. An early die state is displayed at HBCC-3078. The Bass Collection included 21 different 1802/1 half eagles, representing six varieties including three with each obverse die. 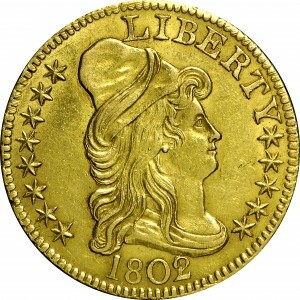 In his Complete Encyclopedia , Walter Breen mentioned seven reverse dies with the first obverse and four reverse dies with the second obverse. 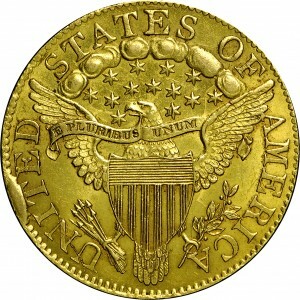 It is now believed that the first obverse is known with five reverse dies and the second with three reverse dies. Purchased from Hathaway and Bowers Galleries, October 7, 1970. "Obverse: 2 over 1, the 1 is to left of center under the 2, and thin. 1 lacks its top serif. Clashed. Reverse: Crack at UNI. CUD partially covers top of (I)T(E). Lapped, weakening the lowest arrow. Clashed."